Time sure has been flying by lately. Had a last minute trip to Arizona over this past weekend. It was a wonderful trip, but put a bit of a wrench in my painting time. Arizona is not a state that's ever really been on my list to explore. If you know me well you will know I am much more at home in the lush forests of New England, or the Mists of the UK, then I am in the desert. In theses past months I have ever so slowly begun to fall a little in love with the landscape there. 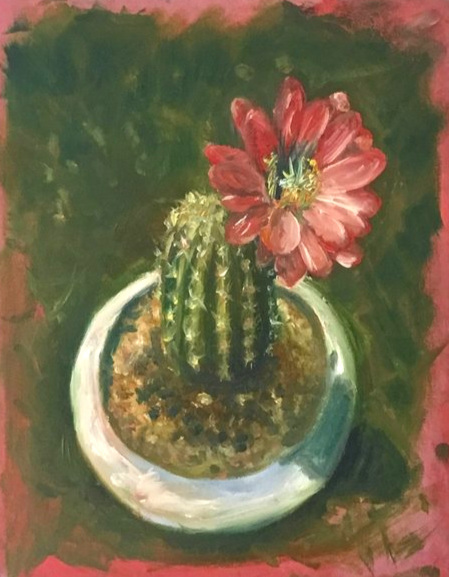 The colors, the cactus, the shadows... the rugged, dramatic shapes, they are bewitching. Its funny to see some of the places around Phoenix, as I have heard of the shapes of the land there since I was small. Camelback mountain and Hole In The Rock are two locations that feature in a series of books that I have read over and over again since childhood. The stories of The Little Coronel, by Annie Fellows Johnston have had an everlasting impact on my whole perception of the world. There is a magic in the land there I now am starting to understand. You can feel the age of it, the rocks, like sleeping giants guard who knows how many secrets. The Cacti seem to be like little animals, ready to scamper across the plains at any second. They are like little creatures, each species imbued with a different personality. I look forward to more wanderings in that captivating land. So the magic of the desert has taken me. Here is a little Prickly Pear Study from last night, I hope you like it, and dream of the desert tonight.